There is some truth in advertising. 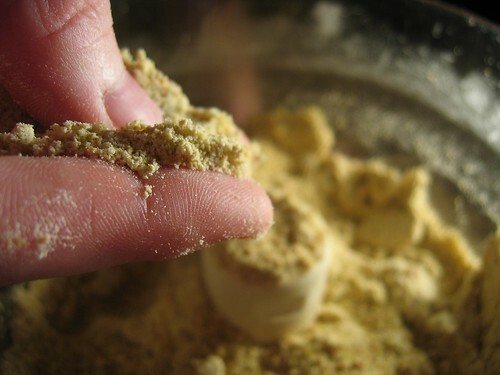 Fried chicken really is finger lickin’ good. But it is also extremely hard to prepare well at home, at least in our experience — which is why Col. Sanders is wearing that stupid grin on KFC’s ubiqutous sign. The colonel knows that when a fried chicken urge overtakes you, you’re more likely to grab a red-and-white bucket of his crispy fried breasts and thighs than attempt to make your own. That’s right. It was while flipping through TV channels over the holidays that my husband and I had our hopes rekindled for the possiblity of tasty home-fried chicken. A stroke of luck (or my husband’s overactive clicker finger) landed us on the Food Network just as Paula Dean, soaked in her Southern charm, was showing viewers how to make some alluring fried chicken. Not only did it look outstanding, she made it seem so simple. This was in contrast to our past encounters with frying chicken at home. Those results had been less than appetizing: greasy bird parts, soggy coating that slipped off and failed to deliver a crunch, and a generally unappetizing fried oil smell that lingered for too long. Col. Sanders was not only grinning at us… he was taunting us. But my husband must have gotten fried chicken on his brain anyway, because not a week after seeing this episode he declared that he was going to attempt pistachio fried chicken… a nuttier variation of Paula Dean’s recipe. Despite the TV evidence that this recipe could work, I was somewhat skeptical. Skeptical, that is, until I saw those beautiful chicken quarters exiting our cast iron pan. Golden brown and delicious they were, with meat that was tender and moist. And when I pulled away a delightfully crispy piece of skin and was met with a satisfying and terrific crunch, I knew that we had vanquished the colonel. 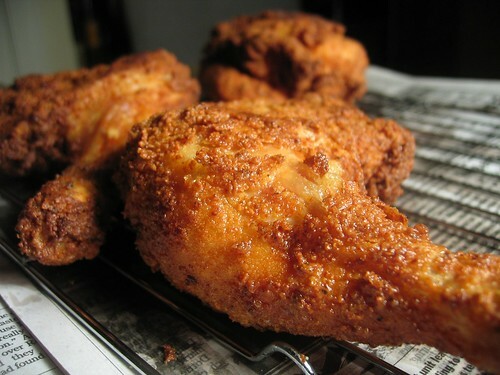 Yes, folks, you can make good fried chicken at home. 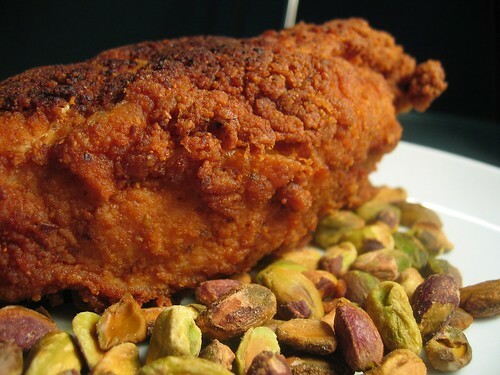 And if you have a taste for a nutty, crunchy skin on your fried chicken… try my husband’s pistachio fried chicken. You won’t be sorry, and — bonus — the colonel just might be! Shrimp ‘n’ grits. Need I say more? For the uninitiated (are there any poor, deprived souls out there? ), grits are good. And of course, shrimp is good. Therefore, shrimp and grits are really, really good. It makes perfect sense, and causes me to wonder why I didn’t do better on the damn logic portion of the GRE. I had never had grits before I attended college in the South, and the school cafeteria didn’t really do them justice. It wasn’t until I ventured to order grits in a restaurant that I acquired a rabid taste for them. Now, I’m slowly eating my way through the (usually shrimp ‘n’) grits offerings at our favorite haunts. But my husband here has just made it a little bit harder for those establishments: He has set the shrimp ‘n’ grits bar astonishingly high with his latest creation. 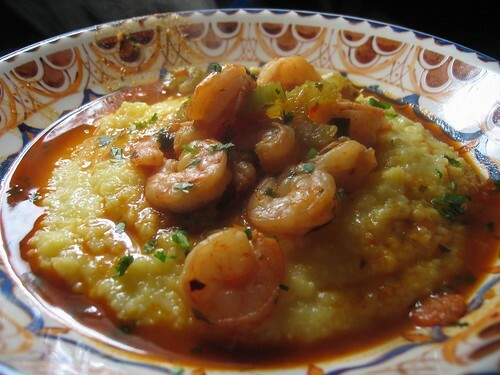 His shrimp ‘n’ grits combines my favorite sauce for shrimp (spicy and Cajun) with creamy, delicious grits. And the two do play well together: The heat from the buttery cayenne-laced sauce infuses its goodness into the shrimp and veggies, and then mellows out when it hits the thick and creamy grits. If you have a crusty bread roll and a fork, you’ll be a happy camper. Tuck in, folks. Tuck in. 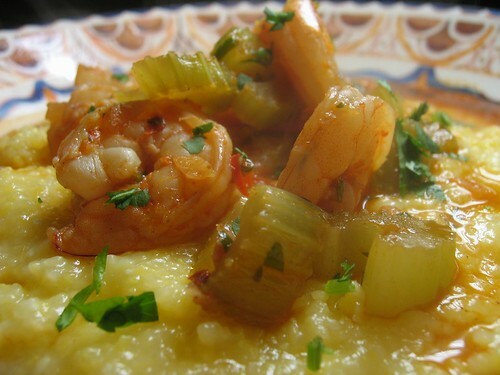 Click here to download the recipe for Spicy Shrimp and Grits. I loved doing this event. While this is not the largest event ever done, I was moved by the remarkable quality that people put into them. Without exception, each of the entries speaks to a very personal place the food comes from. People have such a sense of where they live and what they eat. I hope everyone enjoys this run down as much as we enjoyed hosting the event. Columbus Foodie’s Becke sent in Spaetzle mit Speck und Eier (Noodles with Bacon and Eggs) This is a really neat recipe influenced by her own family in the South of Germany, the State of Hesse to be more precise (which I admit I looked up after reading her post). She describes this recipe as a Southern German take on spaghetti carbonara. This sort of recipe is why we did this event, to learn new regional food and to hear connections to people and food. Kevin of Seriously Good sent in what I think is a quintessentially regional eat—sorghum syrup and biscuits. Sweet sorghum is a grassy grain used to produce syrup. The syrup has a distinct flavor and African roots that grounded itself in the US’s South long before the Civil War. Kevin gives us an important look at its role in his life and how food is often associated with home. Kevin apologizes because he was having photo issues, but personally, I couldn’t careless. The story and the piece of history he brings us is infinitely more important and the food still looks delicious. Mickey of Kitchen Inferno sends us another piece like Kevin’s. His recipe, Smoked Pork Chops with Sauce Beautiful, speaks to a history and a different time. Mickey recounts the traditions of soul food and its expansion as the South and Southerners changed during the first part of the 20th century. I love dishes that speak of much more than what you are eating. 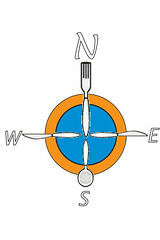 Brilynn of Jumbo Empanadas sent in a great recipe with an even better name, Captain Brilynn’s Caribbean Catch. Like many of us who put headlines on things, she likes alliterations and suggests that she might have changed her name for a moment to get that fourth “C” in there. The recipe has beautiful South American flavors with cilantro, salsa, avocados, and that delicious but dangerous, Scotch Bonnet/ Habenero. She suggested serving it with a Juba from another entry, which I think I might want regardless. I do love when people take the sense of what we were doing to heart. From the southern exposure of their house in the south side of Toronto in southern Ontario, Elizabeth of blog from OUR Kitchen brings us a dish that I believe might have its roots in Southeast Asia by using cumin and hoisin. This delicious dish is Hoisin Chicken and Broccoli. She hoped she didn’t stretch the “South” too much, I’m just surprised more people didn’t. She gets kudos from us with her free wheeling interpretation. Finally and despite her morning sickness, Jennifer of Weekly Dish sent a beautiful post about this not so fun period and a gorgeous fried green tomato sandwich. My wife and I are terrifically sympathetic to this situation and hope it doesn’t last the whole term. Most pleasing to me is her writing. It had me hooked when she brought up barbeque. She, as a gal from Mississippi near Memphis, contends that barbeque is beef and ribs. I will withhold umbrage from such an affront. Citing my own North Carolina roots, I contend that barbeque is pork and pork shoulder without that thick molasses based stuff. Of course, I am kidding, but she writes well on the subject of how there is no monolithic US Southern cuisine. Editor’s note: I want to appologize to Mickey at Kitchen Inferno and thank his cousin Kevin. Kevin pointed out that I gave Mickey a gender transformation and that was sloppy on my part. I fixed it so now HE gets the proper credit. I’m an idiot. Also, my name is Kendle and my whole life I’ve gotten mail with “Ms. Kendle”, so I try to becareful and I clearly wasn’t in this case. So I’m terribly sorry. You are currently browsing the archives for the Southern category.